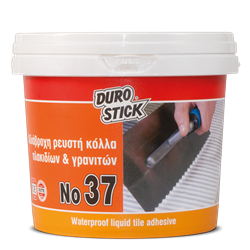 Ready to use and flexible white acrylic tile adhesive, in paste form. Ideal for repairs and touch ups since it is fast and easy to use. Suitable for installations of ceramic tiles, artificial decorative bricks, insulation and soundproofing boards on surfaces of concrete, plaster, drywall, cement board, wood, and sound oil paint, as well as chipboard. Suitable for installing ceramic tiles in damp locations such as bathrooms, WC and kitchens. Necessary for installing tiles that have been detached and it was not possible to remove the existing adhesive. Necessary for installing tiles on wood lofts and partitions, kitchen walls and countertops. Classified D2TE per EN 12004.